Adapting to the ever-changing GMAT exam, Manhattan Prep's Foundations of GMAT Verbal offers the latest approaches for students looking to improve their verbal scores. 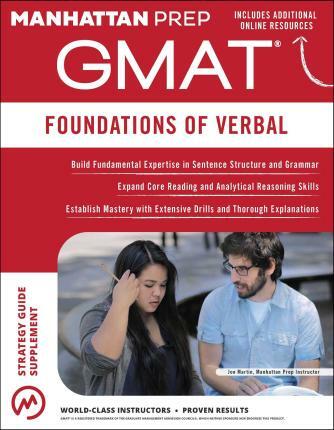 Manhattan Prep's GMAT Foundations of Verbal covers all of the fundamental verbal concepts tested on the GMAT. Updated to reflect Manhattan Prep's enhanced GMAT verbal curriculum, this book covers everything from foundational grammar, such as parts of speech and sentence structure, to logical reasoning and reading comprehension. This new edition provides up-to-date strategies for tackling the three verbal question types--Sentence Correction, Critical Reasoning, and Reading Comprehension--along with easy-to-follow examples and comprehensive explanations. This book is an invaluable resource for students looking to establish a strong foundation upon which to build their later GMAT study. Purchase of this book includes access to the Foundations of Verbal Homework Bank of extra practice questions and detailed explanations not included in the book, as well as to the Foundations of Verbal Bonus Drill Set.